Prasiolite is the green variety of Quartz. The material is extremely rare in nature and is only found in a handful of deposits. The gem gets its name from the Greek prason meaning “leek” and lithos meaning “stone.” Most Prasiolite on the market has been created by heat treating amethyst of a certain composition or has been synthesized. 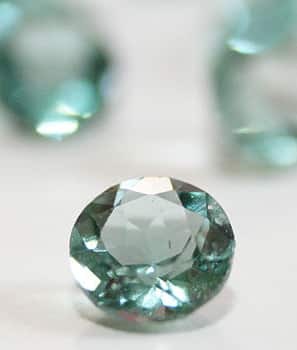 You will not find prasiolite in antique jewelry; the only known natural source that produces gem quality specimens is said to have been discovered in the 1950’s in Brazil. This 2009 paper speaks of irradiation causing some quartz to turn green.